Given the enormity of the Fifa crisis, one aspect of the story that has gone relatively under-analysed concerns comments by the UK government that it is apparently willing to stage the 2022 World Cup if Qatar is stripped of hosting rights. I understand diplomatic tensions between the UK and Qatar increased last week following remarks by John Whittingdale, the new Secretary of State for Culture, Media and Sport. Speaking in the House of Commons last Thursday, the minister intimated England could be ready to step in to host the 2022 tournament if Qatar was ever found to have breached rules during the bidding process. It is understood his words prompted officials at the Qatar Embassy in London to call the Foreign Office to strongly complain, given the Gulf country's assertion it is innocent of any breach of rules. The Foreign Office (FCO) is thought to have provided assurances that Whittingdale's comments were not government policy. Furthermore, FCO officials are believed to have blamed the media for misinterpreting the comments. Foreign Secretary Philip Hammond then sought to reassure Qatar further by calling his counterpart, Dr Khalid bin Mohammed Al-Attiyah, last Saturday morning to discuss the issue. During the call, Hammond is said to have stressed the UK's support for holding the 2022 World Cup in Qatar. He reiterated that view in an interview with BBC World Service later that day. "The UK has been clear from the date the decision was made that we will support Qatar in putting on the best possible games," he said. "Support them by helping them with security arrangements, support them by helping them with technical arrangements in order to make sure that the 2022 competition is the best possible World Cup competition." He also made clear that the UK government "would not support a UK bid for 2022 were there to be a new competition". It is a view that echoes the Football Association's position on the matter and is a reflection in part of the strong trade ties between the two countries. Sporting links are similarly robust, as highlighted just this week with Qatari firm QIPCO's £50m investment in British horse racing. But football and the World Cup are seemingly very different matters. In the wake of the crisis to hit Fifa, it's understood Qatar is preparing to launch a fightback against a renewed wave of accusations it won the 2022 World Cup hosting rights unfairly, and the circulation of what it believes are false statistics of migrant labour deaths in the country. Trade union groups and campaigners claim more than 1,200 construction workers have died in Qatar on infrastructure projects since the World Cup was awarded and have labelled the country a "slave state". It appears there will be no backtracking either when it comes to allegations of corruption during the bid. Sources within the country have indicated they will emphasise how they fully co-operated with Michael Garcia's internal Fifa investigation into how the 2018 and 2022 tournaments were awarded. Furthermore, it's thought Qatar will elevate its rhetoric against what it sees as a campaign against it motivated by self-interest and resentment over the fact it was awarded the World Cup. Domenico Scala, Fifa's independent head of audit and compliance, said on Sunday that both Russia and Qatar could be stripped of football's premier international competition if wrongdoing was ever proven. 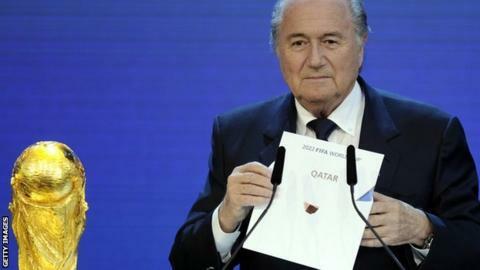 Fifa issued a statement on Monday saying it has "no legal grounds to take away" the World Cups from Russia and Qatar. However, the Federal Bureau of Investigation in the US is probing the bidding process for both tournaments, while a separate Swiss investigation is also under way. Given all those factors, Qatar's fight to hold onto the World Cup it secured five years ago is set to continue for some time to come.